My entire family made reservations at Pio Pio NYC and I have to tell you right here and now it was out of control delicious. 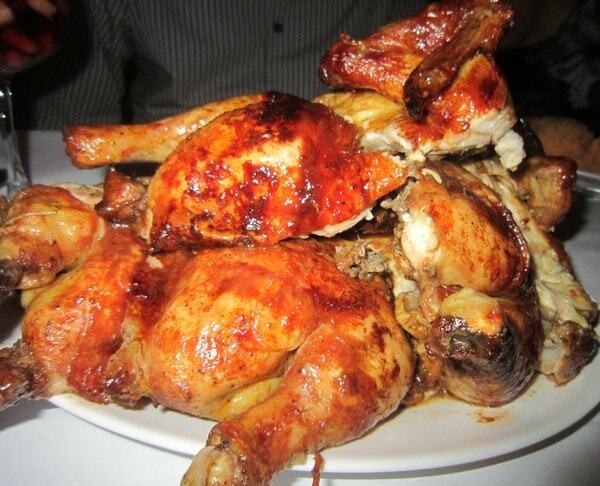 Famously known for their chicken… duh… this local hotspot is one not to miss. But make sure you make reservations because the house was slammed. I thought I’d try to start documenting the places I patron. My husband is an absolute FREAK when it comes to restaurants and food tours – etc. Why not start showing you where we go? You probably aren’t going to believe how often we go out to eat. It’s his one obsession. Bill doesn’t buy clothes, electronics, go to sports games or gamble. He just loves to eat. How can I possibly complain? Last night we drove to Jackson Heights to visit Pio Pio. This is one of 5 locations all around NYC (Manhattan, Queens and the Bronx). My husband is officially trying to get them to open up one in Long Island because it was that good. 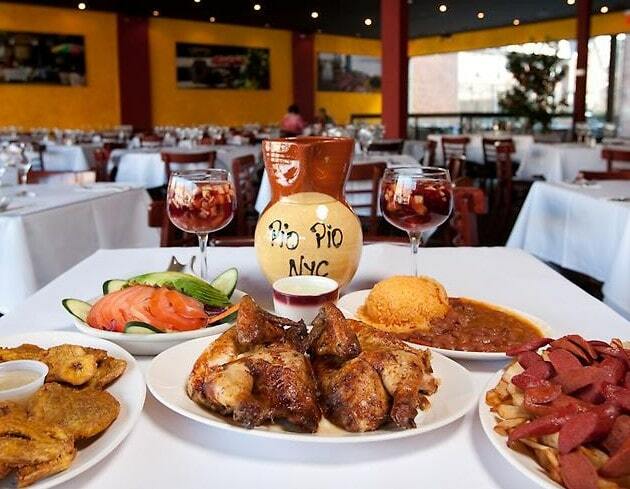 Usually, he would try to get something that I don’t cook at home, but Pio Pio NYC is KNOWN for their chicken. 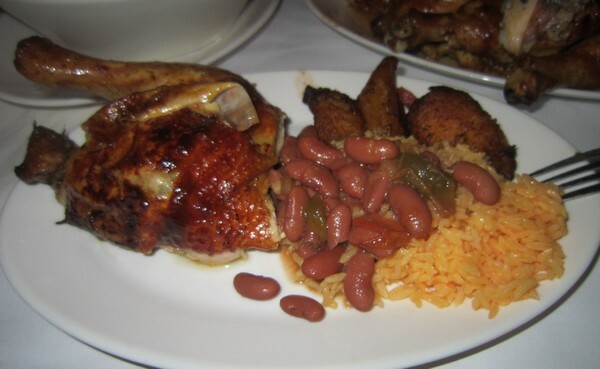 So we ordered two of their whole chickens, rice, red beans and maduros (sweet plantains). It’s family style so you share everything with your group. We ordered. Laughed and caught up for maybe 2 minutes and the food was SERVED. My guess is since we ordered their most popular dish – it’s just ready. All they had to do was pull 2 chickens from their roisterer and cut them up. We kept saying – are you sure that’s ours? It was the FASTEST I’ve ever been served in my life! The food was AMAZING. The chicken was perfectly seasoned and the rice was a dream. I am still trying to master making perfect rice. I just can’t get it to have that bite that a good restaurant provides. My mushy madness just can’t compete. The atmosphere at Pio Pio NYC was very low key. People were dressed differently and it all worked. I was in stretch pants and an over-sized tank and the couple right next to us were both in business suits. Everybody fit in the room just fine. A pitcher of sangria is $25!! We ordered one without asking about the price and fell off our chairs when the bill came. So be sure to ask about drinks before you start requesting them. Previous Post: « Bye-Bye Muffin Top! Same thing happened to me the other day. I took my mom out for lunch for her birthday. We ordered sangria without checking the price. Got the bill…$40 dollars total. Of that. $17 was the sangria!!!!!!! And I am not in NYC mind you, I am in Grand Rapids MICHIGAN! solution for you mushy rice is leave the lid open a bit once you find it mushy cook in 10 minute increments and it will be good to go might take u up to 30 mins more but it will work…..
Hey Vera this place looks awesome. I must take my mom there when she comes to visit. And in regards to mushy rice, all you have to do is add a little less water than the packaging recommends. So if its 1 cup of rice, dont add 2 cups of water, add like 1 and 3/4 and then if it looks like it needs a little more water once its almost done just add little splashes here and there. And I agree with what the other person said too, about leaving the lid a little open. Pio Pio is awesome. I get the seafood platter & it’s awesome. The Seafood combo is my go to comfort food, despite the drive since I now live in LI. They are known for the Sangria & the chicken. You should try Cabana on Austin Street when you are in Queens. The dishes are good also.